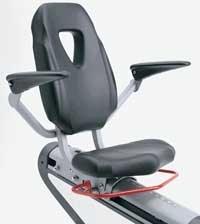 The first thing you notice about the Star Trac Pro Recumbent Bike is that it looks like two units. That’s because Star Trac has taken out the middle section, making it much easier to mount the cycle. Most people choose recumbent cycles because they are easier to use, and the Star Trac Pro has taken this several steps further. Its sleek and aerodynamic design is complemented by a contoured seat built for comfort and lumbar support, plus easy position changes. Coming in silver and black with red trimming, the Star Trac Pro is built of corrosion-resistant aluminum, instead of steel, so it will never rust. The Star Trac Pro’s armrests take the load off your shoulders, too, in addition to providing stress reduction for the back and knees that most recumbents feature. Further comfort improvements include an adjustable reading rack that slides toward the rider, putting less strain on the eyes, and a built-in personal fan, which keeps you cool as you ascend hills or just ride leisurely. In-line skating style toe-clips/straps also give you an extra level of security as you pedal. 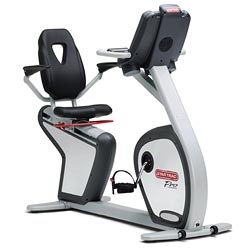 There are 11 programs to choose from on the Star Trac Pro, including two heart-rate and two watts controlled programs, along with an Astrand-Rhyming fitness test. On all programs, your heart-rate will be closely monitored (Dynamic Heart-Rate Control®) and the bike will adjust its intensity to keep you in your target zone. Entertainment options include FitLinxx® compatibility, external auxiliary port for Cardio Theater® and Broadcast Vision. 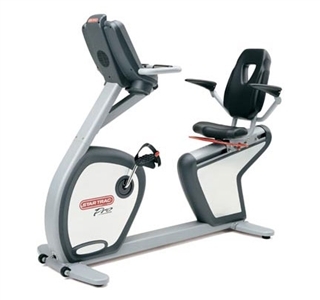 This ergonomically focused recumbent also moves around your home or gym easily; it generates its own power so there are no cords, and comes with rolling casters so you can set it up wherever you want. Dimensions: 66" X 25" X 52"
Seat Adjustment Range: 20" - 29"